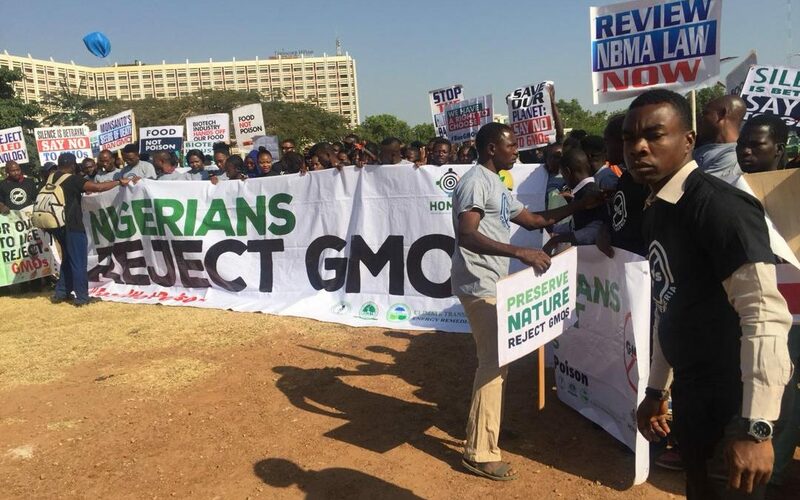 Hundreds of people including farmers, youths, women, students, medical practitioners, and scientists and CSOs were convened in Abuja On 7 December 2018, by Health of Mother Earth Foundation (HOMEF) in a rally against products of agricultural biotechnology known as GMOs (Genetically Modified Organisms). 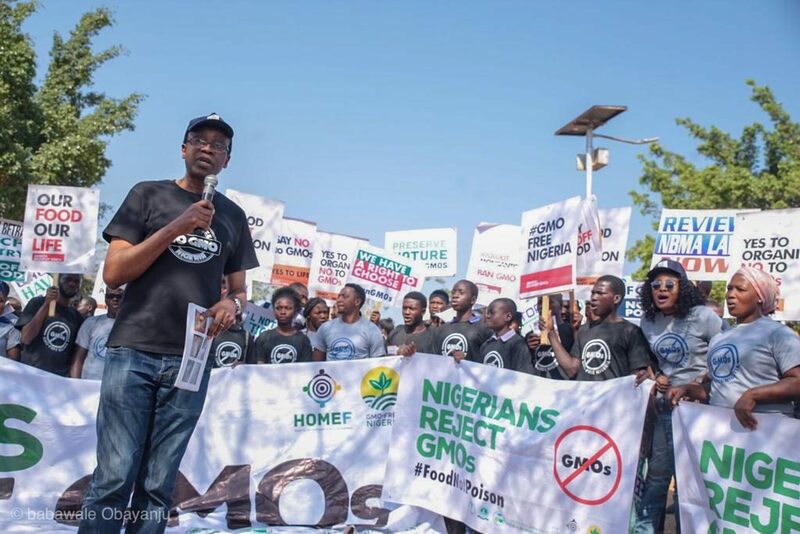 The aim of the rally was to publicly denounce the unchecked admission into Nigeria of genetically modified (GM) crops and productswhich poseseverethreats to our food system, biosafety and overall wellbeing. 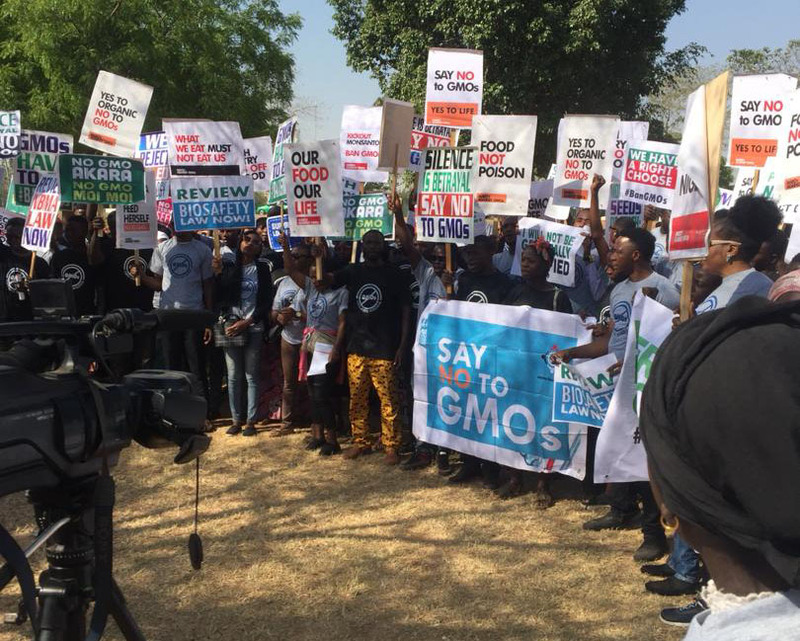 The rallyalso aimed to increase public awareness onthe implications of agricultural biotechnology, toreinforcecallsfor a ban on GMcrops/food products and instigate action for better protection of our food systems and biosafety. An important highlight of the rally was the presentation of findings of the report (tagged What’s on our Plates?) of a survey carried out by HOMEF on the presence of GMOs in our markets. 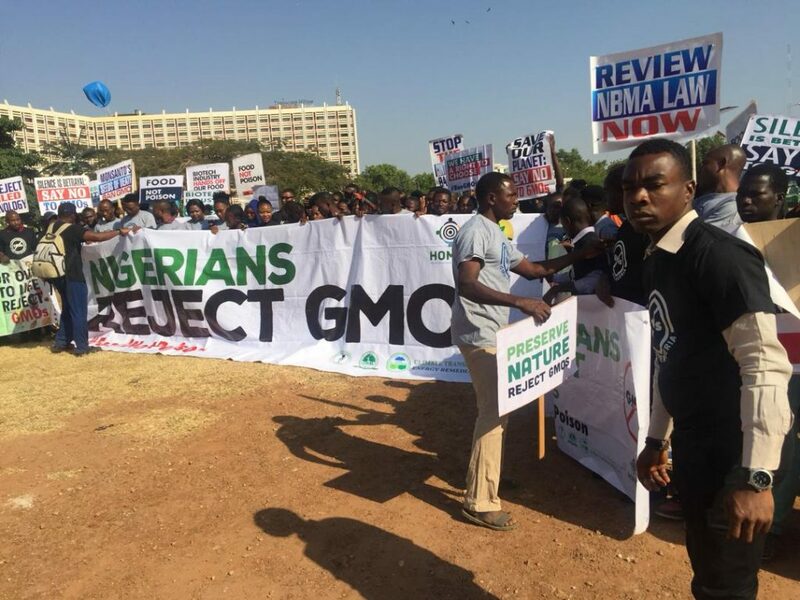 According the organisation’s Director, Nnimmo Bassey, “well over 30 products sampled in 10 Nigerian cities were found to be labelled as produced with genetic engineering or as containing genetically modified ingredients. These products included: cereals, vegetable oils, noodles, mayonnaises, ice-cream, food spices etc. and were mostly imports from USA, China, India, South Africa. Genetically modified ingredients labeled were largely corn and soy”. Nnimmo expressed great displeasure that these products are flooding our markets and people are consuming them daily with no knowledge of how they were produced or their implication on human health. He reiterated that the public and indeed our regulatory agencies must wake up to these threats to our food and indeed our lives, citing that several scientific researches have linked GMOs to severe health complications and diseases. Speaking on commercialization of genetically modified agricultural products in Nigeria, Mariann Bassey, Coordinator of the Alliance for Food Sovereignty in Africa, stated that the National Biosafety Management Agency (NBMA)approves nearly every application[for importation/use of GMOs]brought to it without proper safety assessments, without due consideration of public opinion/concernor the impact of proposed activities on human health, our economy or environment. One case which was said to be of serious concern is theapproval granted to WACOT Nigeria Limited for importation of GM maize over a period of 3 years. The company had tried to illegally ship in truckloads of the GM product in September 2017 but was apprehended and ordered to repatriate the goods. However, in a few weeks after that order, NBMA granted permits to this same company despite the fact that the law requires that a minimum of 270 days be given before any application is approved to allow for proper impact assessments. “More disappointing, is the realization that the Agency failed to get clearance from National Agency for Food and Drug Administration and Control (NAFDAC) as stipulated in The National Biosafety (Implementation, Etc.) Regulations, 2017. 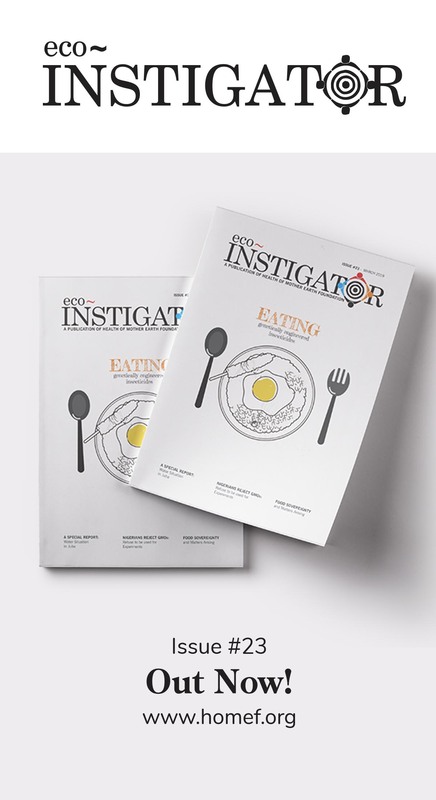 The regulations demand among other things under objective 41. Application for permit to import GMOs and GMO products for commercial productionthatNBMA on receipt of an application in the prescribed form for GM food, shall after acknowledgement of receipt forward information relating to food and feed safety assessment to NAFDAC for review and certification. HOMEF sent enquires to NAFDAC in February and October 2018 as to whether they provided clearance to NBMA after consideration of safety assessments conducted on the said crop and in September 2018, NAFDAC responded and stated that they have ‘not received any genetically modified maize in the name of WACOT Nig. Ltd in recent times for the purpose of reviewing, analyzing or certification’. This buttresses the fact that the law is constantly being disregarded and the health/safety of the people and environment is taken for granted” Mariann explained. It was mentioned that In July 2018, Nigeria registered and released two transgenic hybrid cotton: MRC 7377 BG11 and MRC 7361 BG1.1 into the marketand this was done despite the fact that the modified crop variety is famous for its failure in many countries where it has been used. Nnimmo Bassey explained that Burkina Faso, in 2016, discontinued cultivation of the crop due to poor quality of the output and high cost of inputsand that farmers in India have had a disastrous experience with the crop as it proves ineffective against the bollworm pest and causes instead a boom of non-target pests; increase in pesticide use and in production cost. “China, Indonesia and Pakistan are other countries where the transgenic cotton has failed” he added. 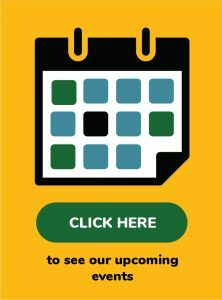 To add to data on failure of this technology, the South African governmentwas said tohave recently rejected Monsanto’s triple stacked GM drought tolerant maize as they found that the data provided by company was insufficient to demonstrate the claimed drought tolerance and insect resistance by the GM event. On November 28th2018, the Ugandan Parliament passed the GMO Bill (Genetic Engineering Regulatory Act 2018)with Strict Liability as one of the major clauses of that Act, meaning that whoever introduces a GMO is legally responsible for any damage, loss or injury that will result from its use.Gbadebo Rhodes-Vivour, Coordinator of the GMO-free Nigeria Alliance stated Nigeria should learn from the experiences of these other nations, take a firm position against the infiltration of GM products and urgently review the National Biosafety Management Agency Act 2015 to close all loopholes (including the absence of strict provision on Liability and redress) that encourage illegal dealings with GMO . He urgedthat we should be circumspect about technologies that aim to contaminate our natural varieties and environment, destroy our agricultural systems, rupture our socio-economic fabric and assert unbridled control over our food system. Also speaking at the Rally was Jackie Iketuonye, Country RepresentativeBio-Integrity and Natural Food Awareness Initiative. She asserted that Nigeria can solve agricultural challenges without selling off our food systems to corporate control. “What is needed is adequate support for farmers in terms of credit loans, storage, processing and infrastructural facilities better access to land and markets for produce. To tackle the menace of pest and diseases, there are effective traditional methods that promote healthy ecosystems instead of endanger them like GMOs” she explained. While we battle with use of GMOs, other technologies that have dire socio-economic and ecological consequences are finding their way to Africa. These include extreme genetic engineering such as synthetic biology (Synbio) and gene drives organisms (GDOs). Gene drives was explained to be a new gene-editing technology that makes it possible to have species-wide genetic engineering by the aggressive spreading of genetic changes through whole species. Joyce Ebebeinwe, HOMEF’s Programme Officer on Hunger Politics encouraged the people to take forward information gathered from the rally and carry our personal research to learn more about these issues to uphold their rights to safe food and environment. A ban of all toxic agrochemicals-especially those composing of glyphosate which has been identified as a probable carcinogen. A halt to the assault on our agriculture through genetic modification of staple crops and a halt on negotiations towards adoption of Gene Drives.